Many of the comments to this series of posts I’ve been doing on Venture Fund Performance have been trying to calculate IRRs from the cash on cash multiples I’ve been posting. That’s pretty much impossible because you don’t know the timing of the cash flows. The IRR data is as prevalent as the cash on cash multiple data, but I prefer looking at cash on cash because that’s how we get paid in the venture capital business and because I think it’s a better determinant of how well a fund performs. IRRs are driven largely by the timing of cash flows. An early big hit will impact IRRs for years to come, but since you can’t just turn around and put the money back in a 35% instrument, it’s not as valuable as a fund that delivers 3-4x on your money. OK. Enough on why I prefer cash on cash multiples. Here are some IRR numbers for the median venture capital fund from 1981 to 2003. I found a new source of venture capital performance yesterday. A friend sent me some data from a firm called Private Equity Intelligence (PEI). I am not entirely clear how they get their data, but it appears to voluntarily reported by the fund managers. In a previous post, I looked at sample sizes and noted how Venture Economics sample sizes have gone down precipitously in recent years. The PEI sample sizes in recent years are about the same as the Cambridge Associates sample sizes. So I included PEI data along with Cambridge data for this post. These are "average" fund IRRs from 1981 to 2003 calculated two ways; media and equal weighted by fund size. As with every chart I’ve published on fund performance, the first thing you notice is the huge run up in returns in the mid 90s (the golden years). I prefer to look at the numbers from 1981 to 1990. 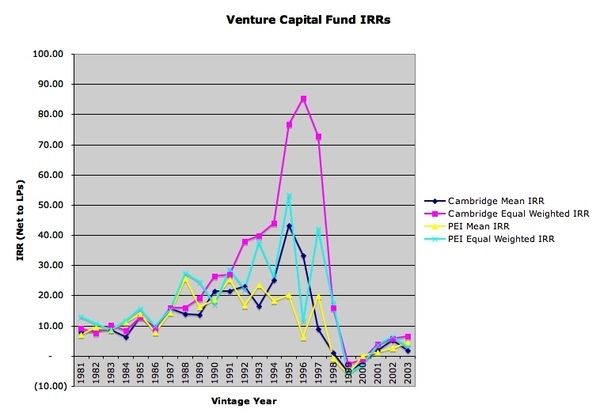 For some reason during this period the average venture fund IRR went from 10% to 20%. We saw the same trend in an earlier post where we looked at cash on cash returns. During that period, cash on cash returns went from 1.5x to 2.5x. So one thing we can ascertain from this data is for a typical fund cash flow, 1.5x translates into 10% net IRR to LPs and 2.5x translates into 20% net IRR to LPs. We’ve spent time recently looking at the ugly years from 1999 to 2003 and this slide shows that the average fund is still producing negative IRRs for the 1999 and 2000 vintages. That was obvious from the cash on cash returns as well. It’s too early to make any definitive statement on the ultimate IRRs that will be delivered by 2002 and 2003 funds and I personally think they’ll do OK.
It’s been said that the average venture fund over the past 20 years hasn’t performed any better than public equities. It sure looks like that’s a true statement. If you take the ugly years out of that calculation, then the numbers are roughly 5% better across the board and then you are approaching a proper risk adjusted return for the asset class. My last thought on this topic is that venture capital is a manager selection problem. If you’d been in the top quartile over the entire period, including the ugly years, the average Net to LPs IRR is about 25%, about twice the median return. If you are going to invest in venture, you’d better be with the top managers or you’d be better off in public equities.